I dislike it when people take pictures of me. It’s not the normal I-don’t-really-look-the-best-I-look-right-now-so-could-you-please-spare-me-while-I-hide-my-face-behind-this-binder (or whatever the feeling or opaque object actually is), but rather more of something else (or maybe this is how others feel as well, consciously or unconsciously, and it just doesn’t get communicated until…maybe…now). Have you ever had someone take a picture of Half Dome with you and possibly a few friends in it and felt that the naturally pristine topography of Half Dome has been horribly ruined by the presence of humans? Here’s the thing: nature is beautiful. Okay, this is arguable (as well as many of my other points in this post), but I think nature is beautiful, even though sometimes it’s beautiful for the exact opposite reasons in different occasions: the glacier-carved jagged Canadian rockies and the rotund hills of Fremont are both pleasing to my eyesight. But of all the things that came out of nature, humans are not beautiful. Humans are generally visually displeasing. They have a very weird variety of body thicknesses from foot to head, and they have these appendages called arms that droop from the body when upright like the leaves (are they leaves?) of a willow, except grossly fatter. They’re not fit for taking pictures of simply because it’s not worth it. Take a picture of a star jasmine, a bunch of grapes, or a jellyfish, or even a bear instead. And make sure no humans are near, not just in case the bear attacks the human or vice versa. I feel that when one makes a picture, a sculpture, or any static representation of a physical human, not only is one shortchanging the idea of a picture, sculpture, or etc., but also one is shortchanging the essence of the human. Sure, one could make it an art and a pretty fine one if done properly, but one could do much better. Here’s the question: how much can you learn about humans from just a picture of them? Think about it. Assume it’s a person you have never heard of before. What can you conclude about their occupation, their interests, and their philosophy? How can you learn more about them? Maybe add some action, like have them in a video. That’s an improvement. But if we want to stay static, we have a great choice in performing a meningeal inversion. The human is ugly, but the human brain is beautiful. The essence of the human is the brain—it is what carries this species, one that otherwise would readily collapse in the face of dashing speed, piercing claws, and crisp instinct exhibited by its (hses—to compromise if you insist) natural competitors. The human exists to think. By the way, if you don’t know his name and you want to, hopefully the only reason you wish to know it is to pursue linguistic knowledge or to satiate a curiosity that his name might relate to him as a person. Otherwise, you’re probably doing something that has become a societal habit: subscribing to the belief that a name is necessary for identification. Okay, so now I’ll tell you: his name is Richard Feynman. 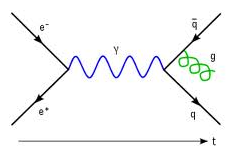 Did you learn anything more about the person who made that physics diagram (which, by the way, is called a Feynman Diagram) other than that his name is Richard Feynman (and his father probably had last name Feynman?) once you learned that his name was Richard Feynman? Meanwhile, below is a picture of me.